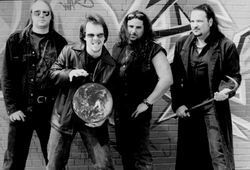 Skulgrinder (2004-present) is a Power Metal band from Floral Park, New York, USA. aking cues from Black Sabbath, Iron Maiden, Metallica and Judas Priest, Skulgrinder emerged out of Floral Park, New York, USA to a barrage of traditional heavy metal in 2004 to release their debut Island Of Lost Souls on guitarist Michael Knight's 'Knight Music Productions' with the fellow membership of Brian Andersen (vocals), Curt Robinson (bass) and Kato J. Peragine (drums). The debut album was a sort of concept album where each song represented a different character living in a in decay. Their style could be best described as traditional classical heavy metal mixed with more modern Thrash tendencies that melds into a sort of power metalmix of real vocals and strong beats.